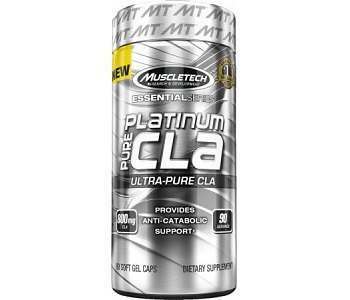 This is a review of the product Platinum Pure CLA by MuscleTech. The manufacturer states that this product is gluten free and completely free of stimulants, which is not always the case with weight loss supplements. CLA is designed to help your body lose weight without losing muscle mass. Platinum Pure CLA contains 800mg of CLA derived from safflower oil per capsule. 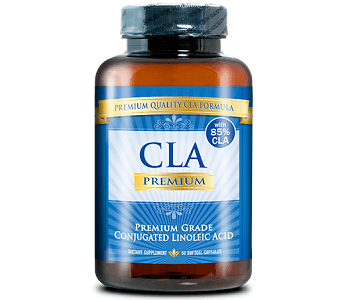 CLA stands for conjugated linoleic acid and it is naturally found in meat and dairy products. However, we don’t generally eat enough of these foods to consume enough CLA, so this is where supplementation comes in. CLA found in supplements is manufactured from the linoleic acid found in vegetable oils. The benefits include increased fat burning, increased muscle mass, and it also works as an appetite suppressant. Research has shown that a supplement should contain at least 80% CLA to be effective, however, there are no details provided as to the exact percentage of CLA found in this product. It is recommended to take three softgels a day with a full glass of water. You should take one softgel before breakfast, one softgel before lunch, and one softgel before dinner. The manufacturer has not indicated any side effects with taking this product. As with all supplements, it is advised to speak to your doctor if you are pregnant, nursing, or taking any other medications. The manufacturer does not sell this product from their website. They only provide a way for you to find a physical store to buy Platinum Pure CLA. After some research, we found that you can buy this product online from various retailers for around $15 for a bottle containing 90 capsules. The manufacturer has a warning on their website about buying counterfeit products, which seems to be a major downside of not being able to buy directly from the manufacturer. The manufacturer has a form on their website where you can submit details of your purchase to determine if it is a counterfeit or not. The manufacturer does not seem to provide any guarantees with this product. They also do not seem to provide much information about their manufacturing process and facilities. The reviews we found online for this supplement were mostly positive. Based on user reviews, this seems to be a good product to use. It also contains a decent daily serving of conjugated linoleic acid from safflower seed oil. However, the manufacturer has not indicated the exact percentage of CLA found in the product which should be at least 80%. The manufacturer has also not provided much detail about their processes and facility and any certifications they have. It is not clear if they have a cGMP certification and if their products are third-party tested. They warn against buying counterfeit products which seems to indicate this is a real problem. This is one major drawback of not being able to buy directly from the manufacturer. We think you should look into alternatives where you are guaranteed the real deal, and also for a product that comes with a money-back guarantee.